Recommended Name: � the Portuguese-derived Javanese pattern. This pattern was originally classified as IP-1.4. Although in its later days it was exported from Belgium to Celebes, it seems more likely that its origins lay in Java. The cards were known locally as "Omi" (ombre cards) or "kertu gedé" (big, i.e. European as opposed to Chinese, cards). Although the cards are quite clearly Portuguese-derived it is quite possible the designs reached Indonesia via Japan, for the pattern shares with certain Japanese cards the crested object which is the oriental version of the Cup suitmark. They also emphasise the colouring of suits, particularly the scarlet swords and green batons, as found in the luxury 48-card and Un Sun packs of Japan. In addition, the manikin usually found on the 2 of Batons has become a bird. The court figures, however, take European costume and in hand painted variants of the pattern, while the period of the costume varies, it is Western. The earliest example known of the pattern is an exquisite hand-painted version, probably c.1700, now in the possession of the Deutsches Spielkarten Museum in Leinfelden. It is incomplete, but clearly part of a 40-card pack. The decoration is typically and charmingly Indonesian and full of wild life; birds, beasts and flowers. It is not known how this pattern survived, but it did, and the 20th century products of Belgium incorporate nearly all the details of the early version albeit less artistically in spite of being printed in many colours, including gold. Such cards were expensive and for the use of the rich. Less sophisticated, locally printed "Omi" cards of Celebes are described under IP-1.51. Van Genechten of Turnhout reported the cards as being very popular at the beginning of the 20th century and continued to make the cards until the 1930s. Although the cards were employed primarily for Ombre, they were also used for other games such as Baccarat and Chemin de Fer. 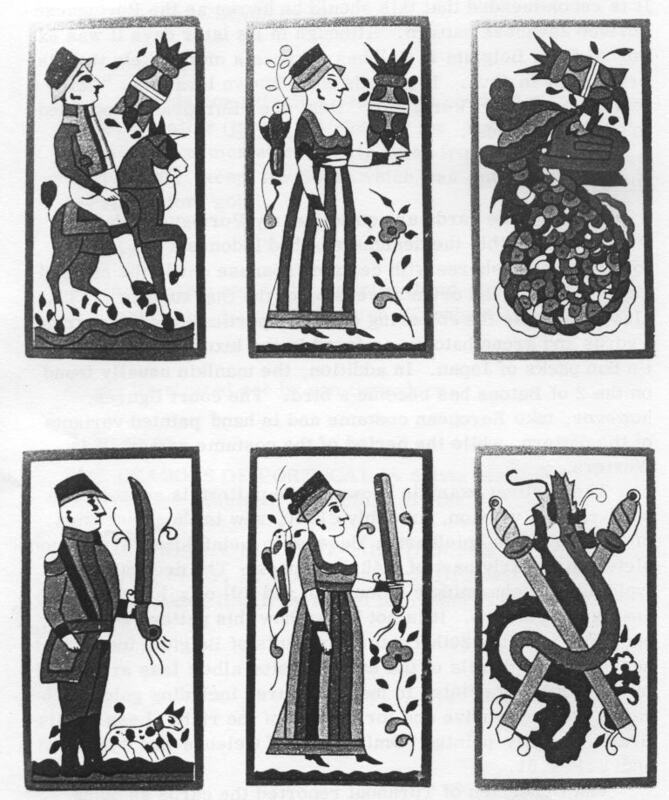 40 cards comprising 4 suits of 10 cards (1-7, Maid, Cavalier (jarong - Makassar for 'horse') and King). Suitnames were mostly taken from the Portuguese, except for Coins which was bulaeng, Makassar for 'gold'. Anon, 18th and 19th centuries (hand-painted with two variants). A. van Genechten, Turnhout, 19th-20th centuries. THE DRAGONS OF PORTUGAL by Sylvia Mann and Virginia Wayland. 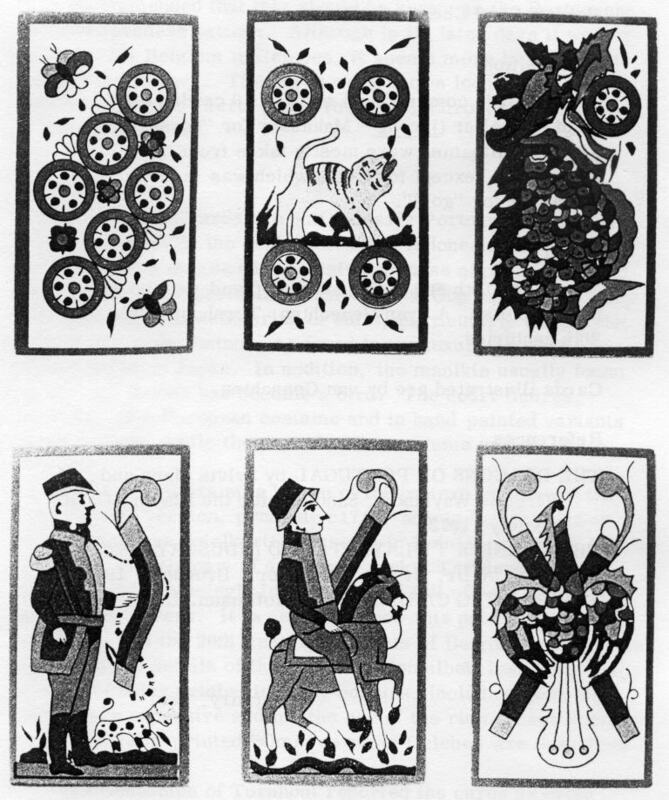 Sandford for the Playing-Card Society, 1973. THE TURNHOUT PLAYING CARD INDUSTRY (1826-1976) by Dr. E. van Autenboer. Brussels, 1976. THE PLAYING CARD by Detlef Hoffmann. Leipzig, 1973. Cards made by van Genechten.